After the switchover, the “Reserve Bank” shall then become the “Bank in Use” and the “Bank In Use” shall become the “Reserve Bank.” The control panel includes a line gauge, two bank gauges and incorporates six LED’s: two green for “Bank In Use,” two yellow for “Bank Ready” and two red for “Bank Empty” on the front of the cabinet. 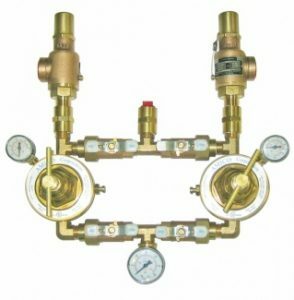 The manifold consists of two bank regulators (dome bias) used to reduce the cylinder pressure to the two line regulators which in turn controls the final line pressure. 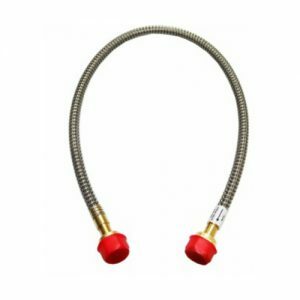 The manifold has an intermediate and line relief valve that is internally connected to a common vent port, terminating into a 1/2″ (13 mm) FNPT pipe. The unit shall be compact, measuring 19″ high x 17″ wide x 9″ deep (483 mm x 432 mm x 229 mm). 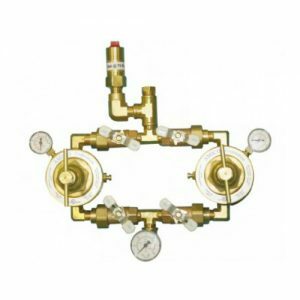 • The manifold shall be equipped with a 3/4″ (19 mm) outlet shutoff valve. 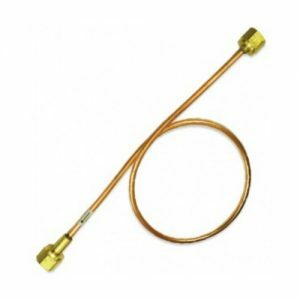 The valve comes complete with a 3/4″ (19 mm) type “K” 6-3/4″ (172 mm) long pipe extensions and 1/8″ (3 mm) port for an optional pressure switch. 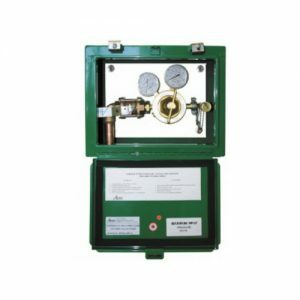 • The manifold cabinet is for general purpose use with an optional NEMA-3R enclosure for the power supply. 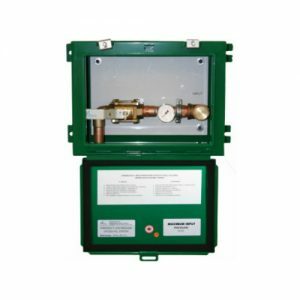 • NEMA-4 enclosure is an option for outdoor use. 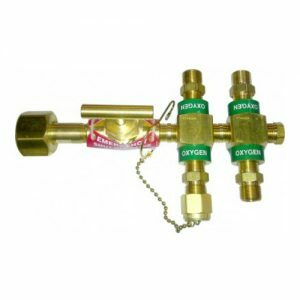 • Optional heaters are available for Nitrous Oxide and Carbon Dioxide manifolds. 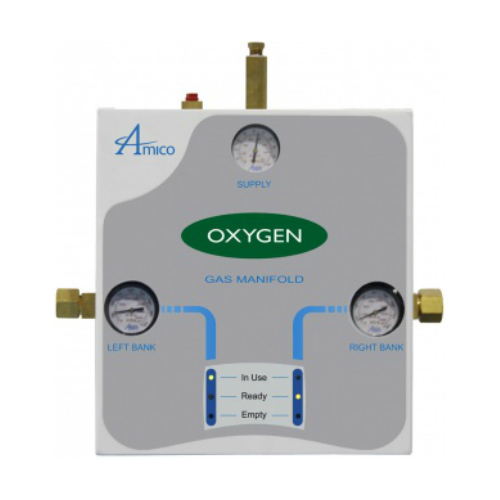 • The flow capacity of a nitrous oxide and carbon dioxide manifold depends upon the environmental conditions at the installation site and the number of cylinders in service. 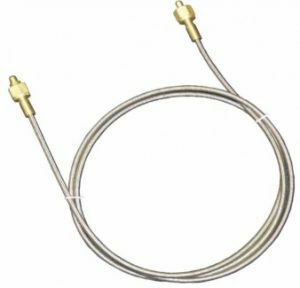 Installing them in a location that exposes it to an ambient temperature below 32˚F (0˚C) is not recommended. 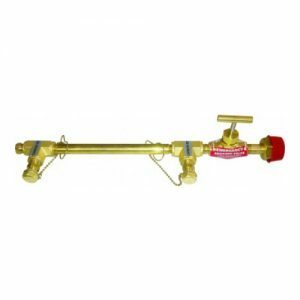 • The manifold shall be installed in accordance with the requirements stated by NFPA 99, CGA, and all applicable local codes. 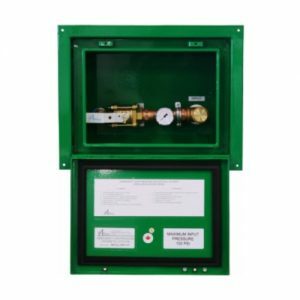 Amico recommends the control cabinet be located at an installation site protected from rain, snow and direct sunlight.